The world’s LGBT (lesbian, gay, bisexual and transgender) communities party in the streets around 27 June, the date in 1969 when police raided the Stonewall Inn, a gay bar in New York’s West Village. The ensuing Stonewall riots lasted several days and are considered to be the beginning of the modern gay-rights movement. Celebrations typically climax in a flamboyant parade, which, in New York, proceeds south on Fifth Avenue, through Greenwich Village and past the Stonewall Inn. The week of parties leading up to the NYC parade includes raves on the piers and rallies in the parks, all demonstrating the gay community’s pride in itself and its lifestyle...not to mention its unrivalled party skills. Inspired by the week, the parade is a glorious cavalcade of feather boas, skin-tight leather, lesbians on motorbikes, transvestites on floats, beefy gay guys in cowboy hats and dazed tourists. Since the first events took place in New York, San Francisco and Los Angeles in 1970 to commemorate the Stonewall riots, late June has become a key date on the gay calendar worldwide. 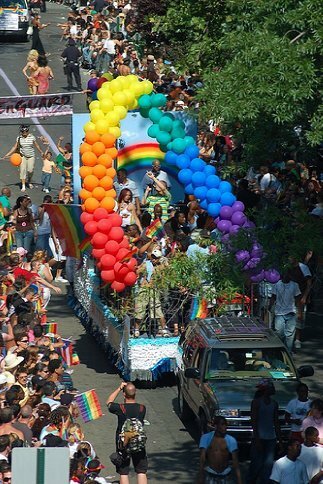 San Francisco Pride is California’s second largest parade, attracting up to a million people. In Europe, where the celebration is sometimes called Christopher Street Day, one of the biggest parties takes place in Berlin. Local Attractions: The Empire State Building on Fifth Avenue is a good place to get your bearings in Manhattan.